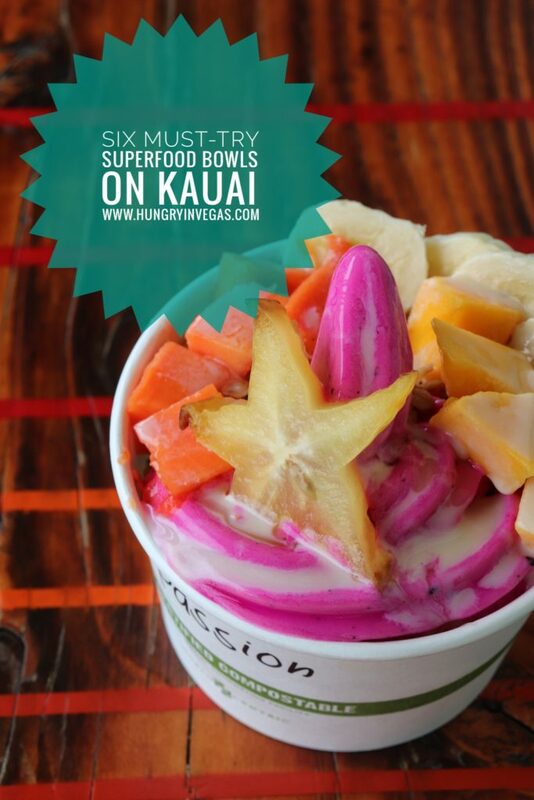 When it comes to superfood bowls, I’m a super-fan! 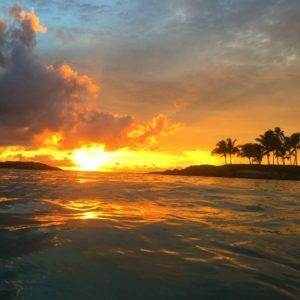 I took advantage of all the delicious tropical fruit on Kauai and sampled every pitaya (dragonfruit) and acai bowl that I could get my hands on. 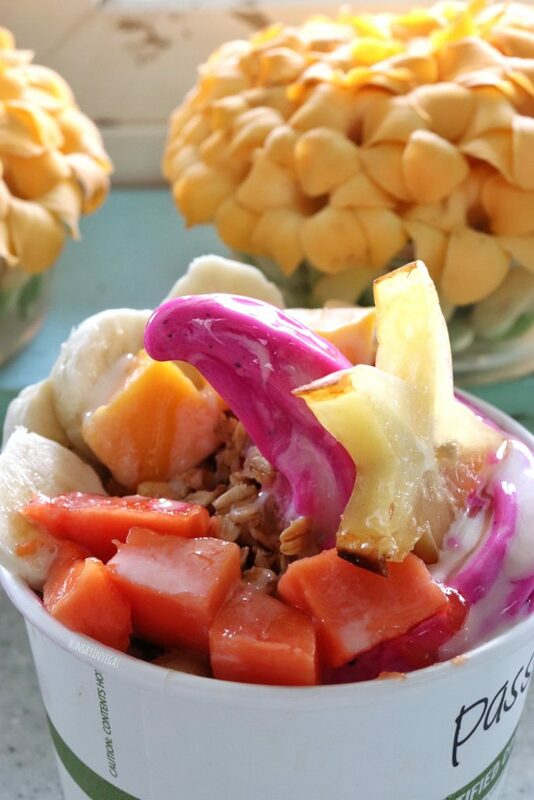 Pitaya has a texture similar to kiwi, and comes in pink, white, and yellow. It’s high in Vitamin C, and low in sugar. 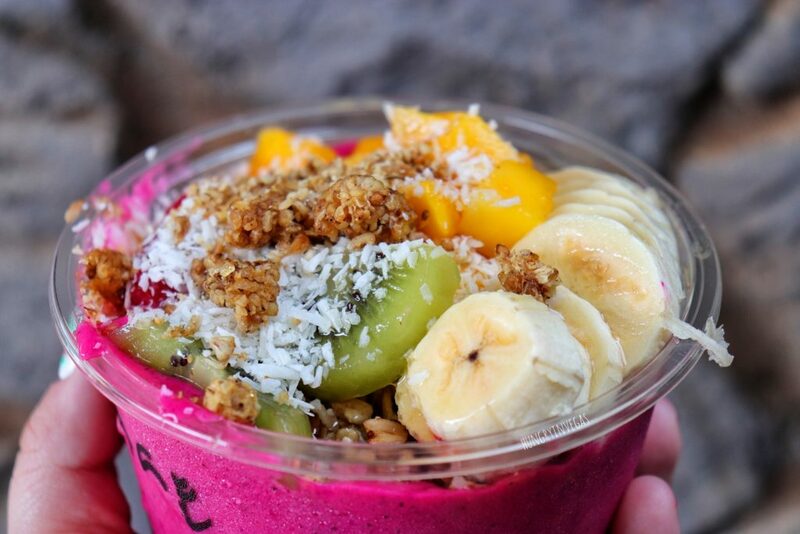 Acai has fiber, antioxidants, and heart healthy fats. A friend tipped me off about this spot, tucked away in the back of a local grocery store. I knew I was in for a treat when I saw the line of locals waiting for their morning fix! I went with Da Dragon, with pitaya, mango, coconut water, coconut flakes, and goji berries, and topped with their locally made granola, fruit, and honey. 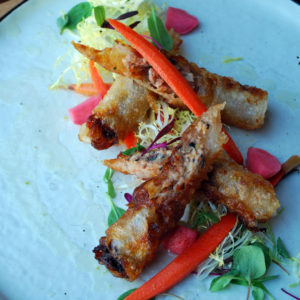 We did a his and hers style fuel-up before driving to Kauai’s north shore. He went for a poke bowl, and I stopped at Java Kai for a Dragon Bowl. 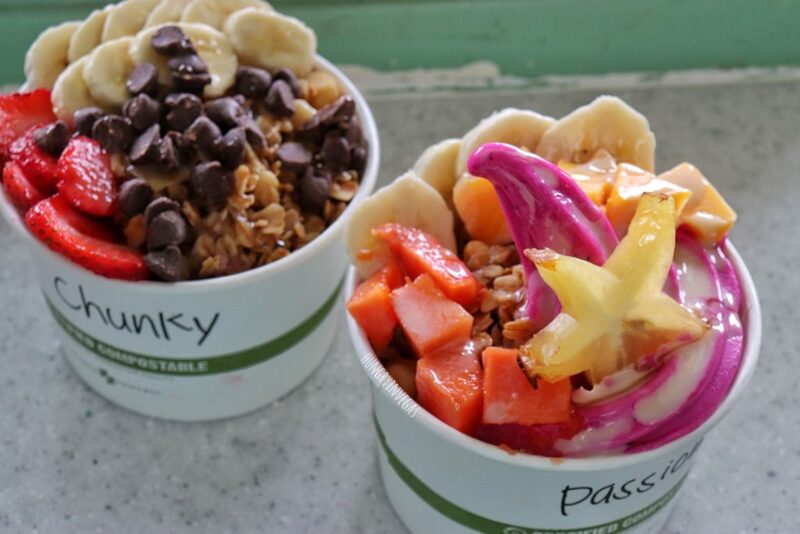 Not only do they have some super Instagrammable walls outside, their bowls (along with the cherry lime slush, and pitaya and lilikoi cheesecake bites) are delicious too! 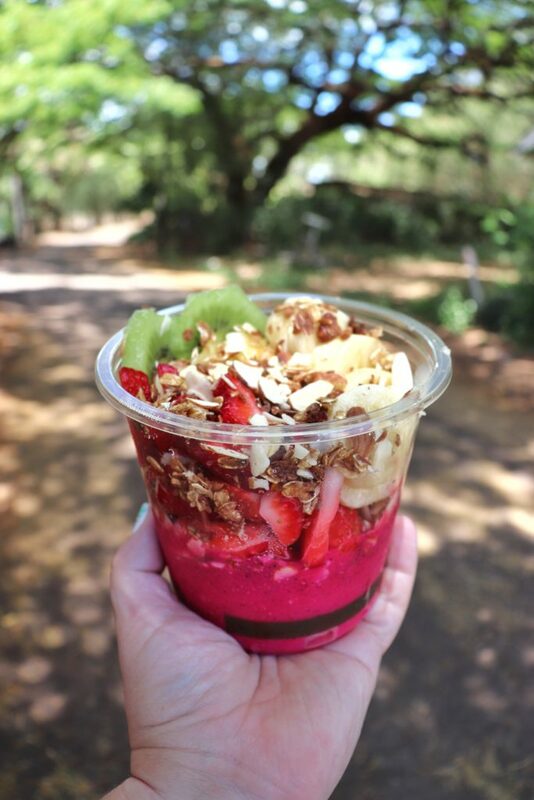 After a gorgeous morning of cruising up the Na Pali Coast with Na Pali Experience, I had a small diva moment and insisted on stopping here for their Pitaya Bowl, topped with seasonal fruit and almonds – I added granola for an upcharge. We spent the day chasing waterfalls, but first – breakfast! 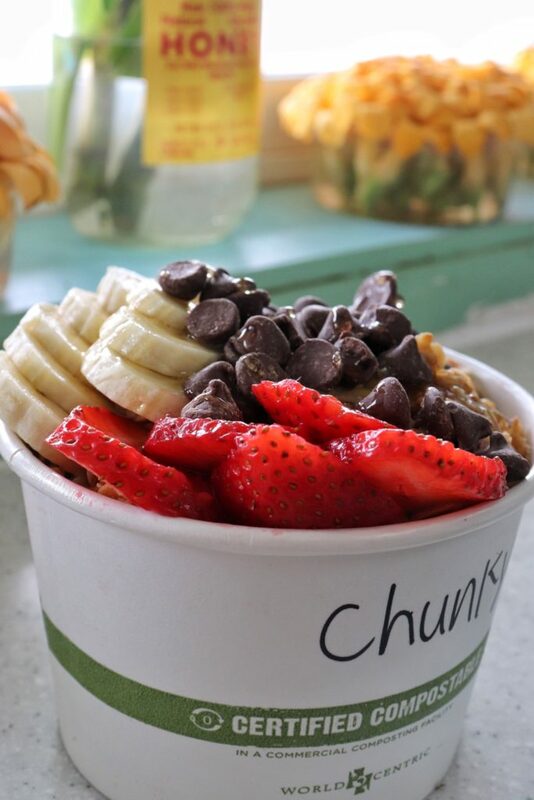 We actually got two bowls from here – the Chunky Monkey – Acai, strawberry, banana, peanut butter, almond milk & chocolate chips, and the Pitaya Passion Bowl – a blend of pitaya, lilikoi, coconut soft serve frozen yogurt, topped with banana, mango, honey, coconut cream and granola. 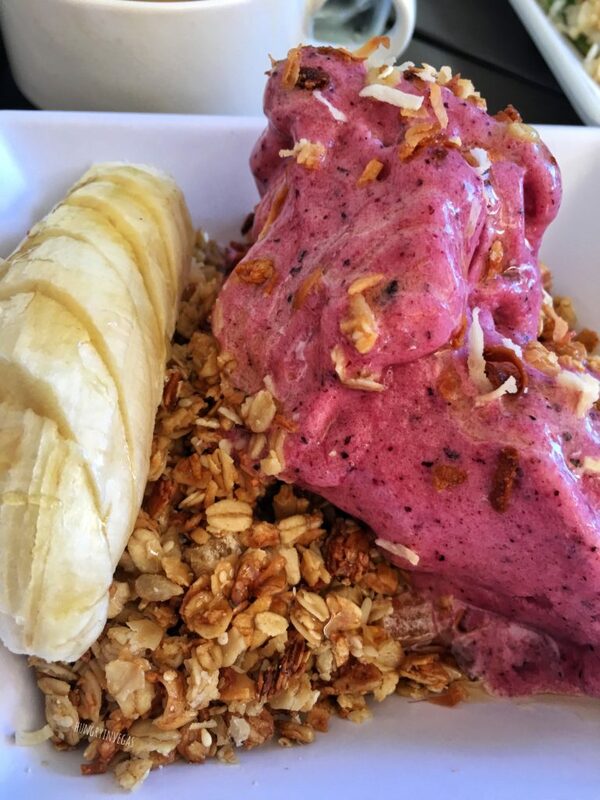 This was the IG husband’s very first acai bowl, as he won’t even eat the ones I make at home! He gobbled it down, and my only regret was not getting him the 32 oz, which was just a few cents more! Not only did I feel like these bowls were the most beautiful, they were also the least expensive. 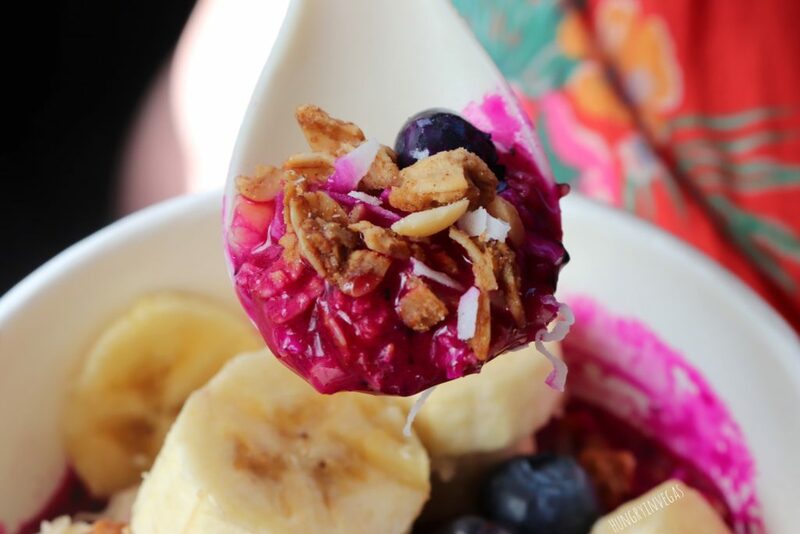 My Pitaya Passion Bowl is not only the stuff of Instagram dreams, but it was hands down the most delicious pitaya bowl I’ve ever had, and I’m on a personal mission to try to recreate it at home now, even if it means getting out my ice cream maker! Pro tip: If you are here on a Saturday, check out the farmer’s market at the community college across the street! Where do you get your favorite superfood bowl? 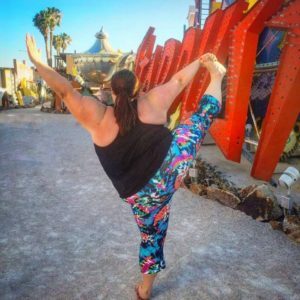 I’d love to see your Instagram pictures if you stop at any of locations, be sure to tag me on Instagram @hungryinvegas! Sharing is caring! 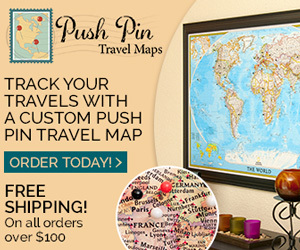 Pin for later, for your next trip to Kauai!